Our customized metallic labels feature a smooth, soft lightweight fabric label that reflects the light from its shimmering metallic thread. These magnificent, elegant metallic woven labels are perfect brand labels for prom dress, evening gown, and special occasion clothes. Sparkle eye-catching metallic labels, in all its multiplex forms, address every fashion challenge in fabulous garme nt label style. 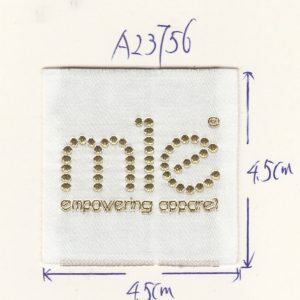 They are hybrid garment labels made of fine metallic thread and polyester threads. Metallic woven on satin fabric labels create an elegant silky finish which is soft and smooth. Metallic satin labels give a nice shimmering look as it has a subtle sheen. 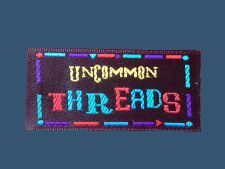 We use the extra fine polyester and metallic threads to create find metallic woven labels; all labels are cut with an ultrasonic cutter to obtain soft smooth edges and decrease the scratch feel when fabric labels against the skin. Adding a perfect stylish finishing touches to designer evening party bags. We have a wide range of available metallic colours threads to weave the stylish shimmering brand woven labels. The available metallic threads colours are blue, gold, silver, red, green, purple, pink, baby blue, orange, brown, grey, dark grey, black, and white. Our contact details are here, we will help to design the high fashion, trendy and shimmering metallic woven labels for an ultimate quality in sophisticated luxe.